Now that spring is here, we are seeing more bikes on the road. Many communities throughout the world promote biking with local or national cycling days, weeks or even a full month. May is National Bike month in the U.S., and National Bike to Work Day is May 17, 2013. Gumby’s getting into the action. Cycling is a great way to be green inside and out. You reduce harmful emissions from auto exhaust, conserve fossil fuels, slow the wear and tear on the car, reduce air and noise pollution, and save money! You’ll find it easier to get a good parking space and you may be able to pass by gridlocked cars in congested areas. Cycling provides important health benefits. It can be a low-impact way for you to keep fit and get a good workout. In addition to burning calories and helping to shed pounds, you reap the rewards of higher metabolism after a rigorous ride. Studies have shown that cycling can increase your longevity. It’s keeps your heart healthy, reduces your risk of heart disease and boosts the immune system. While it improves muscle strength and tone, you’ll also find that your coordination improves. Cycling is a great mood booster, too. Cruising through a beautiful landscape or an action-pack urban environment awakens the senses. The combination of exercise, fresh air and inspiring scenery will clear your mind and make you smile. 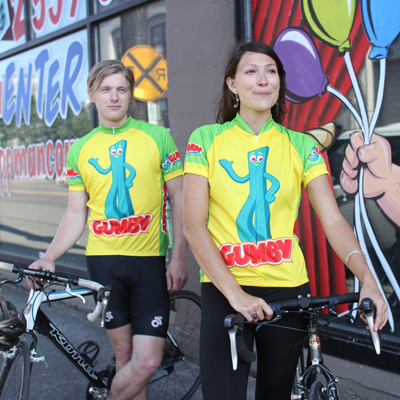 Gumby cycling jerseys for men and women are available at the official Gumby Store. This month we are celebrating the color GREEN. Leprechauns and shamrocks, spring plants stretching towards the sun, a fresh lawn… Can you smell the green? Gumby in all his greenness was there in 1956 before most people had color TV’s. 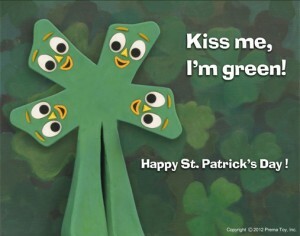 In fact, The Gumby Show first appeared on TV on March 16, in 1957—the day before St. Patrick’s Day. The green trend was on… the Jolly Green Giant, the Incredible Hulk, Kermit the Frog and Shrek followed. According to creator Art Clokey, green represents chlorophyll, which converts light into energy, allowing things to grow and move. The color green breathed life into Gumby. Gumby was the Clokeys’ gift of love to all children. 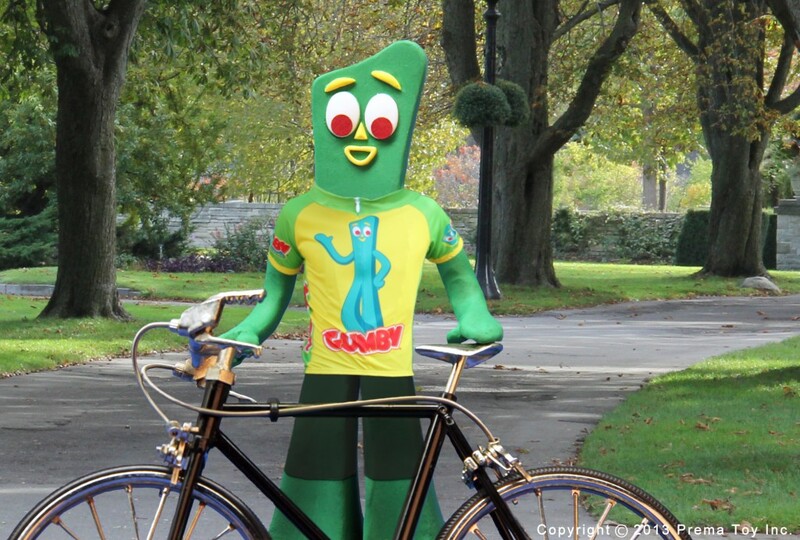 Art would say that love is light, and chlorophyll facilitates the transformation from light to life… Light – Energy – Love are the ingredients of Gumby. Art felt that it was important to speak children of all ethnicities. He wanted his little clay boy to be accessible to children around the world, and he chose green because it is a culturally neutral color. In the fascinating documentary, Gumby Dharma, which chronicles Art’s life and his creative endeavors, Art mentions that Gumby couldn’t be red, white, yellow, brown, or black as those colors had specific connotations. Blue was the color of Krishna, so that wouldn’t work. The color green, as he saw it, was universal and available. In later years Gumby’s greenness also related to various story lines in which Gumby fought factory chicken farms and pesticide use and promoted organic farming. “Green” took on a whole new meaning. To celebrate GREEN, The Gumby Store at www.gumbyworld.com is offering 25%-30% off green t-shirts through the month of March, 2012. Get some green and save some green! Check it out.